This post calls for a little caroling. Hold on, let me warm up the pipes. Mimimimimi! Deck the halls with boughs of holly. Fa la la la LOVE our entryway this year! Christmas waits for no one at our house, not even Tom Turkey. 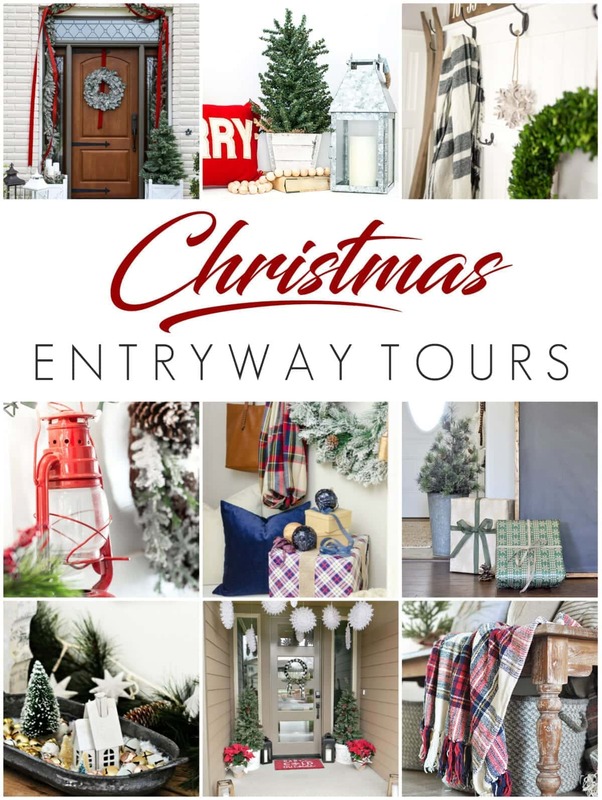 To kick off our holiday home tour this year, my super sweet friend Ashley from Cherished Bliss is hosting a Christmas Room Series, and I’m so thrilled to be a part of it. 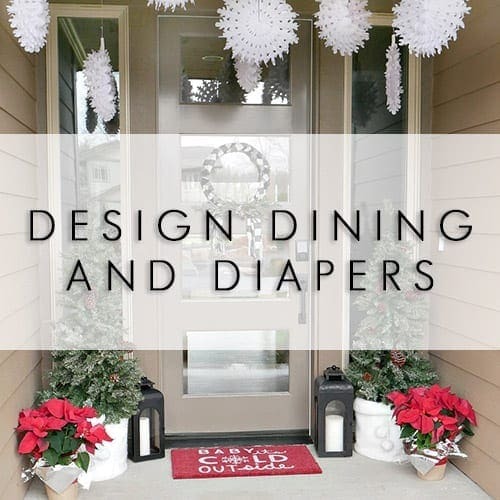 If you’re visiting from Taryn’s at Design, Dining, and Diapers, welcome to our home! Kick your shoes off and stay a while. That’s usually what we do at this spot in our house anyway. I get asked pretty often where I bought this buckboard bench, and I have searched high and low for one like it with hardly any luck (except this one). It was the best Craigslist score ever at just $35. 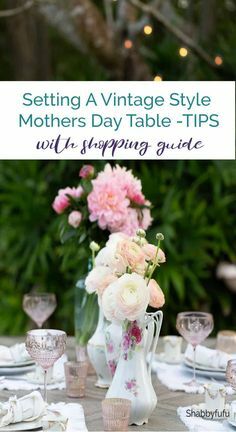 I love decorating around it for the changing seasons in this spot, especially with thrift store and clearance finds. 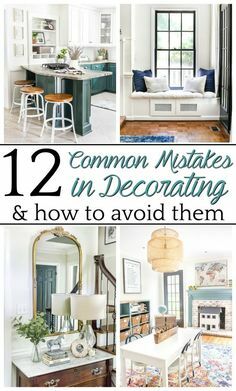 It always amazes me how the best ways to make an entryway (or any room) feel welcoming, doesn’t have to cost very much at all. 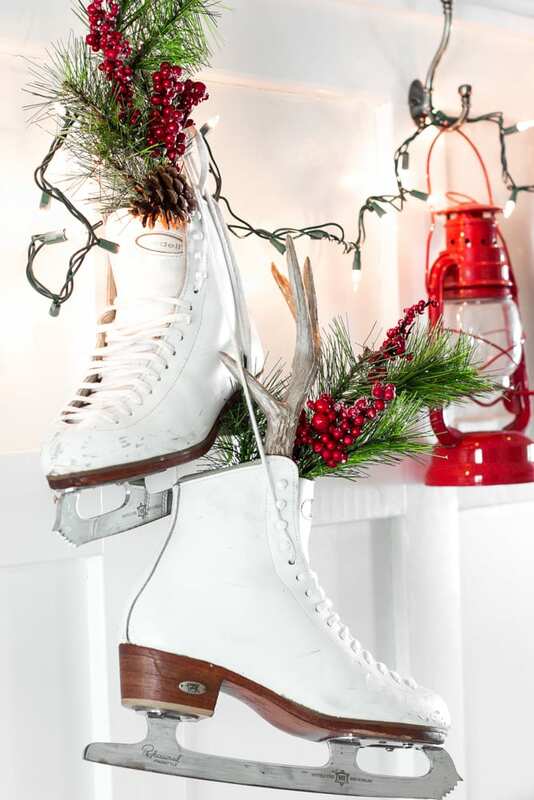 I dug these ice skates off of the toy shelf at Goodwill a couple of years ago, and I bring them out every Christmas… since it never really gets cold enough here in Charlotte to wear them anyway. 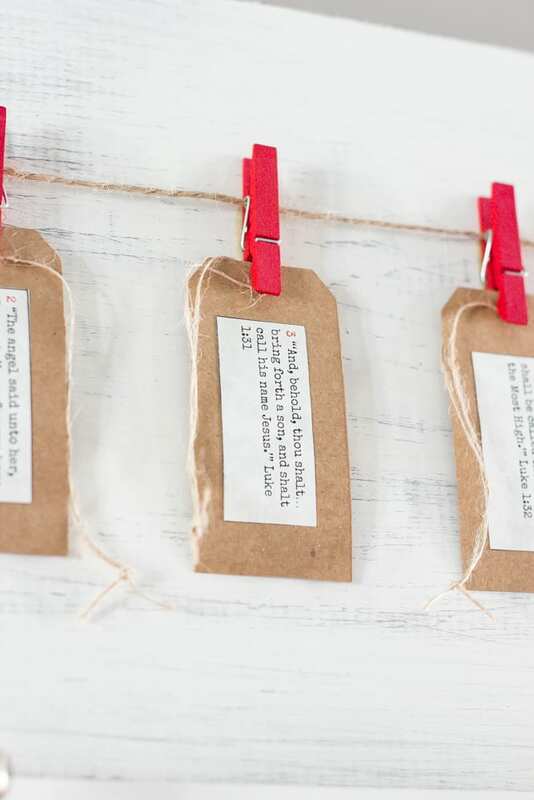 Last year, I made this simple advent calendar using just a wood plank, twine, clothespins, paint, and super glue. 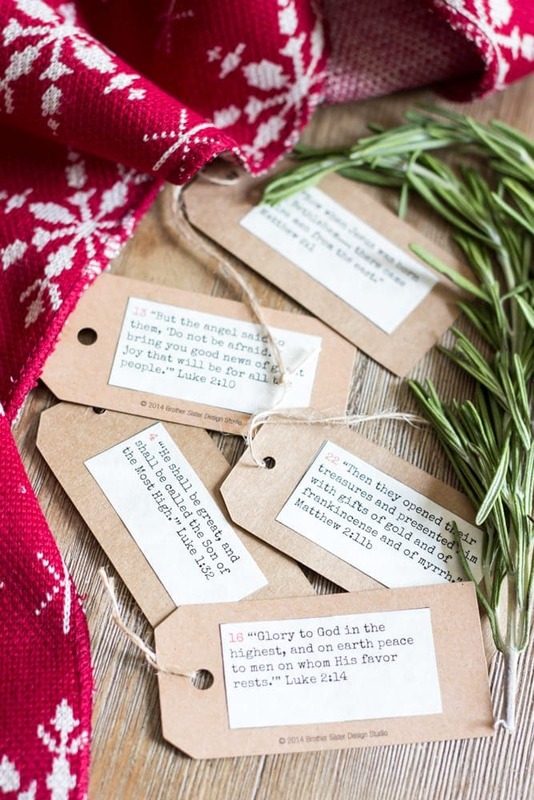 It’s one of my favorite ways to bring the true meaning of Christmas to life for our family. I went kind of crazy with the rest of our entryway decor, but I promise you it doesn’t stay this display-like for long. 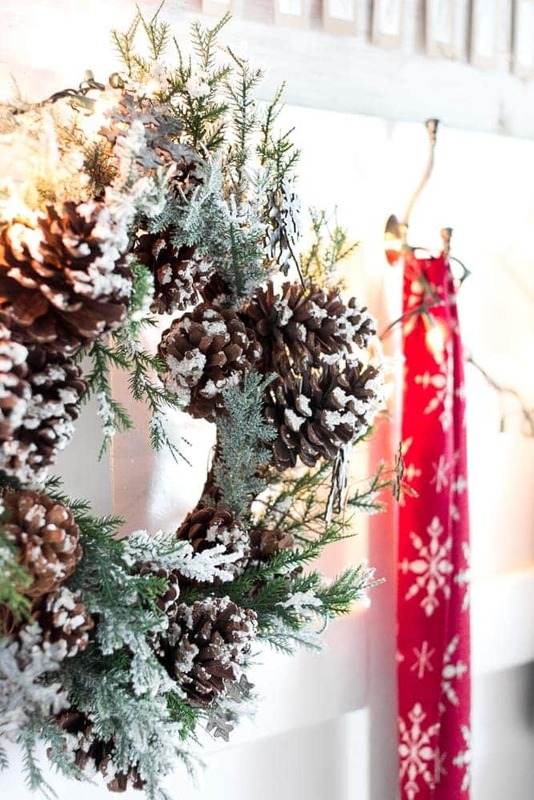 I’m loving these touches of Nordic and plaid prints lately and have used it everywhere in our decor this year. 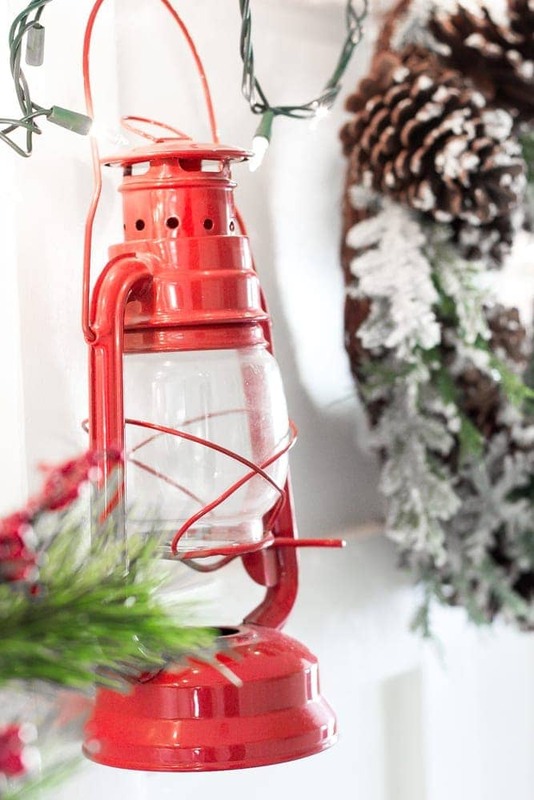 Over the past couple of years, I’ve found three of these festive red lanterns at the thrift store for just a couple of bucks each. 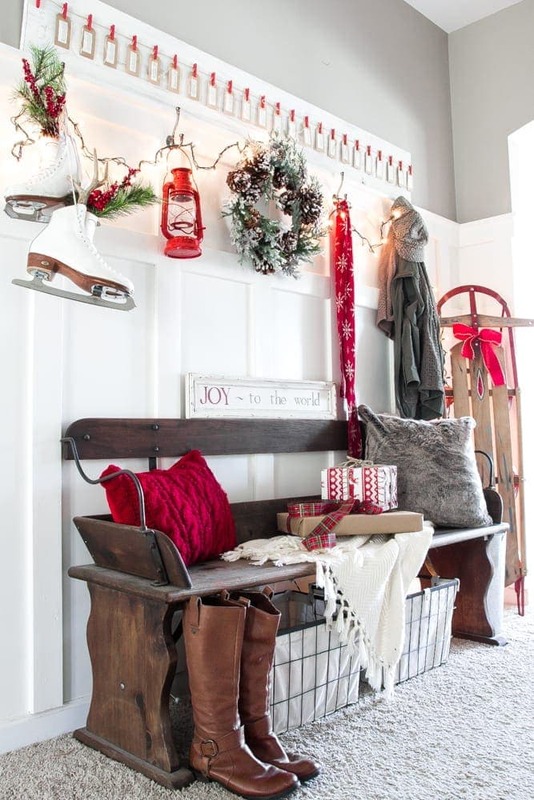 I love how all the red pops against our DIY board and batten this time of year. Beside our bench, I’ve tucked this old sled into the corner that my brother and I used to hit the slopes with on the rare occasion when it snowed when we were little. And it was my mom’s when she was a kid too. 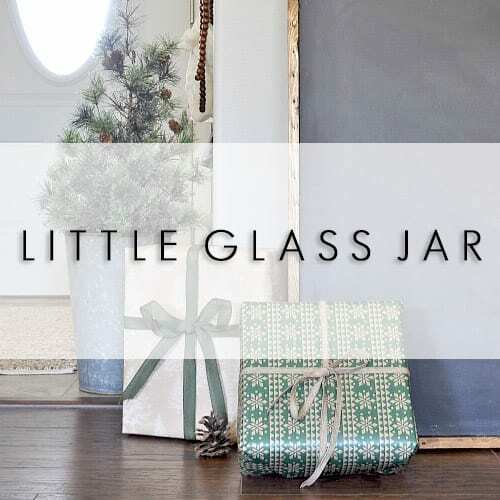 The next stop on the Christmas entryway train is Little Glass Jar, where I know Ashley has put together something gorgeous. 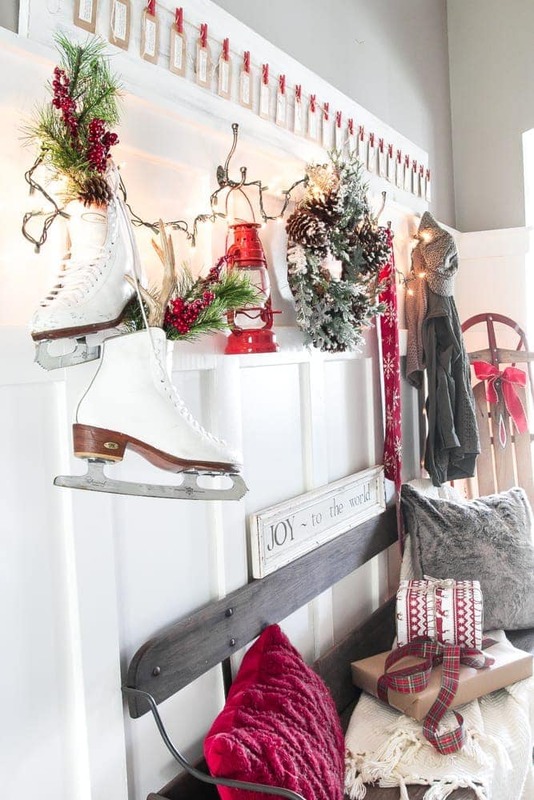 Have you busted out the Christmas decor yet? 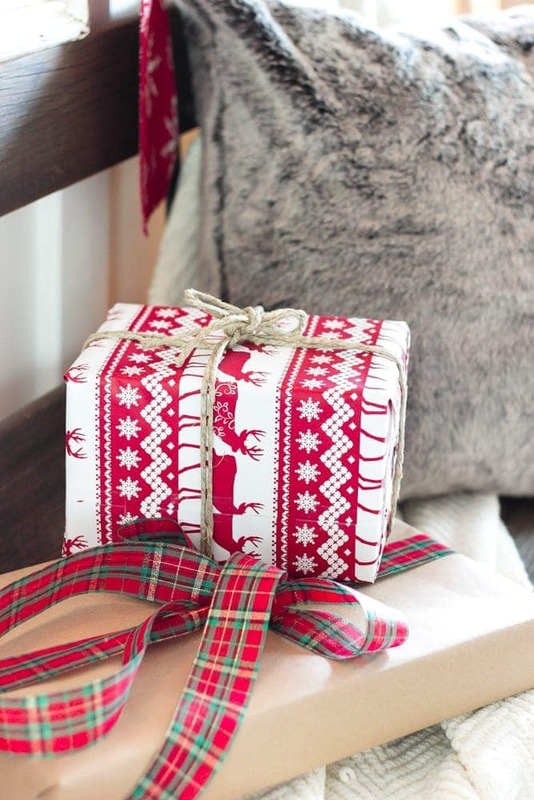 Do you do an advent calendar every year? What do you include in our yours? Chocolate? Ornaments? Christmas books and movies? I’d love to know! This is my favorite so far. Absolutely beautiful. Absolutely gives all who enter a warm and festive feeling I bet. Thank you, Ardith! Glad you like it! Everything looks amazing! 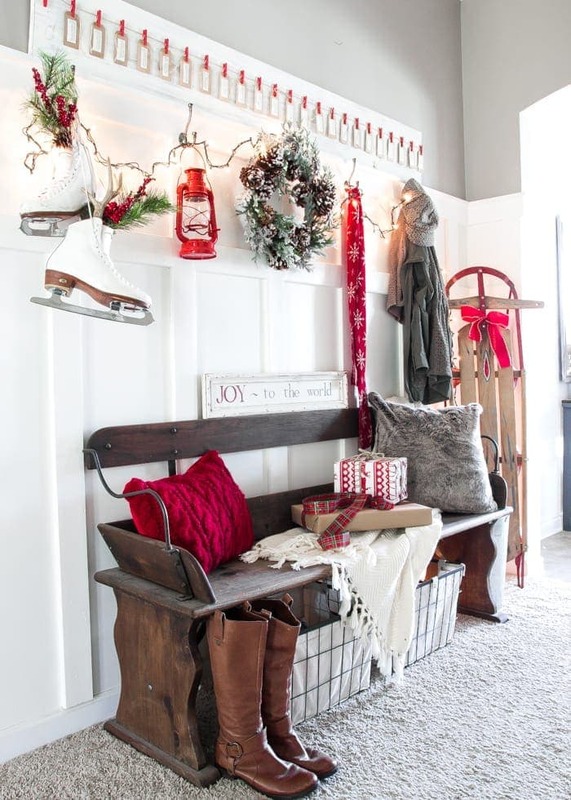 And that bench is so perfect for Christmas time! 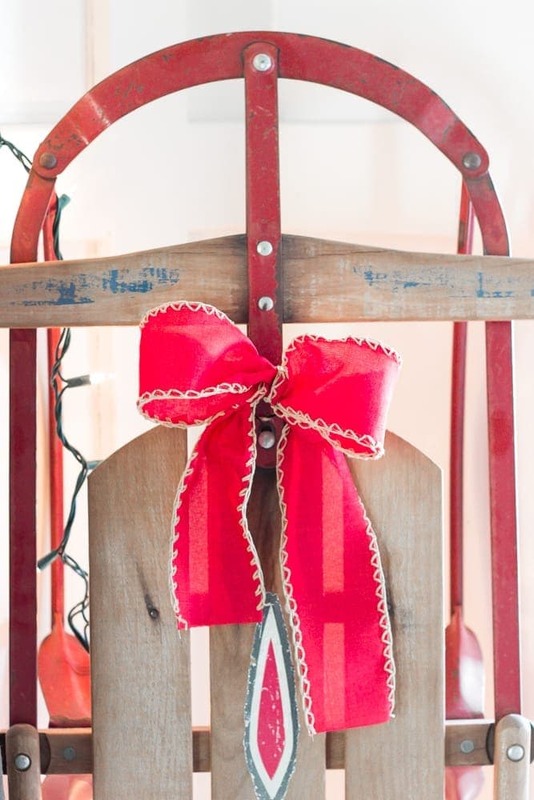 It reminds me of a sleigh ride! I feel like you literally read my mind all the time even though we’ve never met! I asked my husband what we should put in the advent calendar and he said he wanted Bible stories or scriptures. 2 weeks later here they are! I showed them these and he said perfect! Thank you! Entry looks great too? Yay! So glad they’ll come in handy, Tara! Thanks for the love! The tour is a great idea. One thing at a time and the common theme is very “under-whelming” which is what we all need this time of year! : ) I’m looking forward to next week’s tour. I’m glad you decided to take part, and your entry way is just wonderful! Thank you, Karen! Totally agree. So glad we’re not doing the full-blown whole house tour this time around. Whew! If you still have the scripts, I would love a link! Wonderful idea and a great tradition to start. Hi Lauren! I absolutely love receiving your emails. Is the Walmart similar to your wreath, or did you remove the red accents? Thanks, Carrie! They no longer carry the one I have since this wreath is from last year. But the one I linked looks a lot like it, and the red accents could be removed if you didn’t want them. 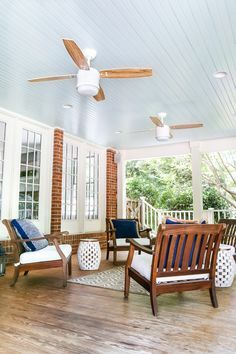 Your entry way looks wonderful!! Thank you so much for the advent scriptures! I have printed them out and plan to use them with my kids! Thank you, Lisa! So glad they’ll come in handy! Your entryway is beautiful. I am in love with that bench! Lovely entry! Finished up our decor this year, doing a bit of a Nordic theme, but borrowed the idea of the red lantern! Love it! Thanks for sharing. Also, I can’t seem to get the link for the advent calendar scriptures to pop up? Not sure if I’m doing something wrong, I’m on the mailing list and all… ideas? Would love to do this like TOMORROW. Ha! Thanks! Thank you!! I am sending you an email for the printables.